More than a week after Hurricane Florence roared ashore in North Carolina, Georgetown County, S.C., just south of Myrtle Beach, was preparing for historic flooding thanks to the hurricane. Evacuations of 6,000 to 8,000 residents was underway last week. “We’re offering door-to-door transportation today,” said Jackie Broach-Akers, public information officer for the county. Two school buildings served as shelter for residents and crated pets in the path of the flood. Lessons learned in Brunswick County, N.C.
What can a storm-ready certification do for your county? “We knew as soon as we saw predictions for Hurricane Florence this was going to be an issue,” Broach-Akers said. “We saw river flooding issues after Hurricane Joaquin and Matthews.” The predicted floods last week were expected to be even higher this time, up to 10 feet. County employees are wearing a lot of different hats during the disaster. “I’m very lucky that my house is not in the predicted flooding area this time,” Broach-Akers said. Flooding in Georgetown County is just the latest episode in the saga of Hurricane Florence, the first major hurricane of the 2018 season, which made landfall Sept. 14 in New Hanover County, N.C. south of Wrightsville Beach, with winds of 90 mph. Rain pushed rivers over their banks after rainfall in from South Carolina to Maryland. New Hanover County, N.C. is still assessing damage, said Woody White, who chairs the Board of Commissioners. In addition to long-term re-nourishment of dune systems, preparing for emergencies throughout the year was key in handling the disaster, said White, who rode out the storm at the EOC and his home. White said that running through ever scenario year after year is what makes getting through such a disaster possible. “Knock on wood we had no catastrophic generator failure,” he said. The county made sure there were back-up generators at shelters, the 911 center and the emergency operations center, he said. They also assisted the public utility authority in making sure there was backup power at the area’s hospitals. New Hanover County worked closely with its municipalities on the timing of evacuation orders and conveying orders to the public, White said, estimating that half of the county’s population of 200,000 evacuated. New Hanover County got the word out about the threatening storm with daily press briefings, consistent messaging on social media and numerous interviews on radio, TV and newspapers. Jason Patno, director of the Charleston County, S.C. Emergency Preparedness Division, said that about seven days before the storm as some models showed the path of Hurricane Florence turning south, the county began talking with the National Weather Service, South Carolina Emergency Management Division, neighboring counties and municipalities. In days leading up to the storm, conference calls were held with about 30 entities on the line, sharing how they were prepping for the storm. It was also an opportunity to ask questions about operations, evacuation orders and recovery efforts. “There’s much more cooperation” at all levels, as a result of dealing with disasters together over the last several years, he said, including Hurricanes Irma and Matthew in 2017 and 2016, and flooding in 2015. The remnants of Hurricane Florence spawned eight tornadoes Sept. 17 in several central Virginia counties. In Chesterfield County, just south of Richmond, three tornadoes were spotted including an EF-2 that touched down with winds clocking up to 125 MPH, collapsing a building which housed a flooring company and killing an employee at the company. 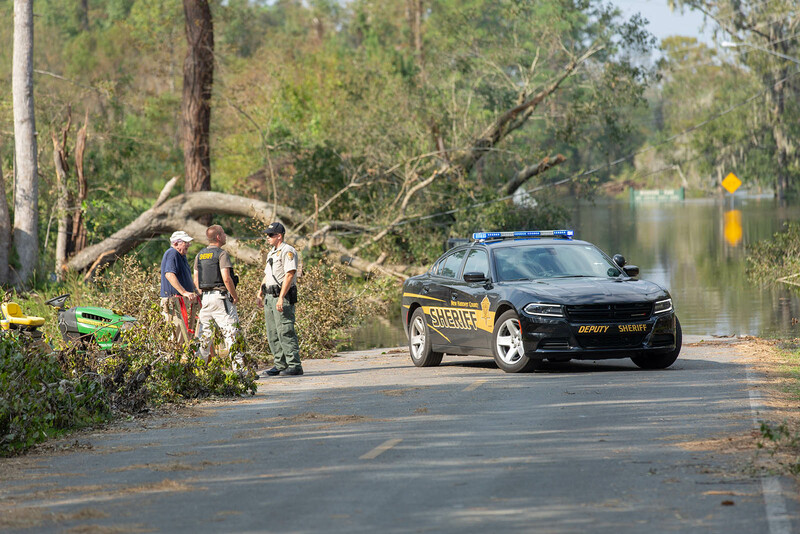 In the 48 hours after the tornado hit, the county reached about 1 million people via its social media posts with updates about road closures and debris removal, according to Susan Pollard, the county’s communications and media director. County Administrator Joe Casey briefed about 10,000 Facebook users hours after the tornado hit by streaming live updates. In addition, the county also posted a video of its building inspector discussing safety concerns with damaged buildings. Several other things that “went right” during the aftermath of the tornadoes included having mental health therapists available, quickly dispatching debris crews who were standing by and partnering with nonprofits. “They tend to become the eyes and ears in the community to help set up recovery teams for residents with unmet needs,” said Emily Dillon, emergency management coordinator. When the winds died down near the home of Frank Williams, chairman of the Brunswick County, N.C. Board of Commissioners, a second threat emerged — widespread flooding that cut the county into three parts for four days. Emergency workers tended to drivers who stalled out on flooded roads or wound up on submerged roads that had washed out. “The sheriff’s office was out and about in a helicopter, in boats, rescuing people at the height of the storm,” he said. Days later, things returned to normal when Williams drove past gas stations that didn’t have lines stretching a half-mile away. “For people who had 8 feet of water in their house, it might be months before things get back to normal,” he said. The county itself suffered minor damage to its administrative building. The commission chambers had 18 inches of water and the bottom floor was flooded, displacing several departments while damage is repaired. “We lost some furniture and had to tear out some carpet, but we were lucky,” he said. Williams said the biggest challenges throughout the storm and its aftermath came from getting the right information to residents, which was made more difficult by the modern fragmented social media environment. “Everybody wants information but they get it from the wrong places,” he said. “I spend half my day on Facebook responding to people and quashing rumors, but your average person isn’t following their county government on Facebook, so it’s hard to get our message out there. Coordinating with nonprofits has been key, but the county is hamstrung in terms of endorsing organizations with which it doesn’t have agreements. “As a commissioner I can make suggestions on individual nonprofits,” he said. “It’s important to make sure people donate the things we need — we need food right now, not water — and that they take it to the right place,” he said. Williams said it was crucial for elected officials to show empathy while also remaining calm. He also recommended staying in contact with other levels of government and leveraging relationships with other elected officials to expedite recovery efforts.